As it turns out, our latest visual treat comes via Red Chapter Clothing, who are apparently putting out a line of some rather eye-catching T-shirts bearing the likenesses of the more notable members of the film’s cast. Below, you can see several of their wares displayed in the image provided. 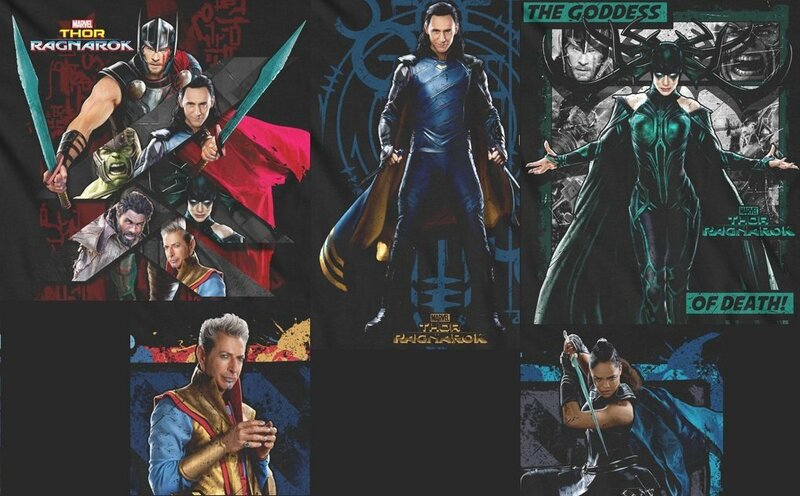 Among them, we see Thor dominating one design, with the rest of the key players joining him as part of a collage of sorts; Loki can next be glimpsed with what appears to be a new color scheme; Hela, the main antagonist, boasts what may be the most stylish design of the lot, while also apparently displaying a little showmanship; Jeff Goldblum’s Grandmaster looks to be plotting something and, finally, Valkyrie stands ready for battle, coming across as the most no-nonsense of the pack.